Billing Department of Northwind Traders processes their Orders selectively for shipment of materials. An Order Selection Screen has been provided with a List Box on which they can highlight the Order Numbers, Filter the selected Orders from the main file and prepare Customer Invoices and Shipping Documents. They must be able to process all the Orders appearing in the list as well. 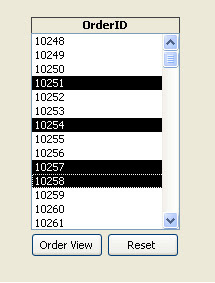 The items appearing in the List Box themselves are records selected from within a Date-Range from the Main Order File. By creating two text controls for start-date and end-date values we can control the selection of records for the list box, if needed. But for now, we will work with items selected from the List Box, for simplicity. We need the Orders Table from the Northwind.mdb sample Database for our example. Import the Orders Table from the sample Database NorthWind.mdb, if it is not already done in our earlier examples. If you are not sure about the exact location of this Database on your PC, visit the page: Saving Data on Form not in Table for its location references. With the above Query we are selecting all the Orders for the Month of May 1998 for the List Box items. The criterion is set as a constant in the Query. The second Query definition will be changed (the criteria part) dynamically based on the selection of items from the List Box. If the Toolbox is not visible click the Toolbox button on the Toolbar above or select Toolbox from View Menu. Ensure that the Control Wizard button (top right button on the Toolbox) is selected. Select the List Box Control on the Toolbox and draw a List Box on the Form as shown in the design image below. On the List Box Wizard ensure that the "I want the List box to look up the values in a Table or Query" is selected and Click Next. Select Queries Option in the next view to display the Queries List. Scroll down the list and find the Query with the name OrdersINQ, select it and then click Next. Select the Fields OrderID and CustomerID from the Available Fields list and move them to the Selected List window, click Next and then click Finish. Align the List Box and its child Label as shown in the sample design above. De-select the Control Wizard Button on the Toolbox and select the Command Button Tool and draw a Command Button underneath the List Box. Display the Code Module of the Form (View - - > Code). Copy and paste the following VBA Code into the Form Module and save the Form. strsql0 = "SELECT OrdersINQ. * FROM OrdersINQ "
crit = "WHERE (((OrdersINQ.OrderID) In ("
strsql = Trim(strsql0) & ";"
strsql = strsql0 & crit & strOrders & "))); "
Open the Form in Normal View. Click on few Orders one by one in the List Box to select them. You can click on the selected item again to de-select it or click on the Reset Command Button to de-select all. Click on the View Orders Command Button to redefine the second Query OrdersOUTQ and open it to show the selected Orders in Datasheet View. If you need all items in the List for output then Click Orders View Command Button without making any selection or after clicking Reset Command Button. 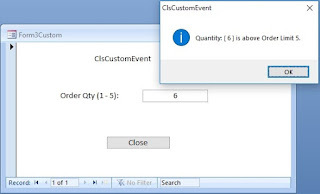 You can use the OrdersOutQ Query with selected items as Source to link with other Queries or related Tables and design Reports to print Invoices or Design Screen to display selected Order Details. Since, you are using a Text Box to set the criteria to filter data in the ComboBox you can use the same Text Box to remove the filter as well. When you set some value into the Text Box and leave out of the Text Box (Lost Focus Event) the Combo Box uses the Data in the Text (if available) to filter the Combobox contents or if the Text Box is empty then the ComboBox wil show the entire Source data. This can be done by evaluating the text box contents and build an SQL String and change the Row Source Property of the Combobox and Requery the Combobox contents. 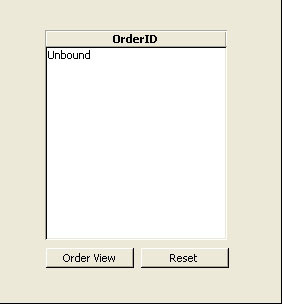 SQL = "SELECT [ORDER DETAILS]. * FROM [ORDER DETAILS];"
SQL = "SELECT [ORDER DETAILS]. * FROM [ORDER DETAILS] WHERE ((ORDERID=" & xOrderID & "));"
I have used the TextBox Name as Criteria and ComboBox Name as cboOrderin the Code. It worked! After that i did som thinking and created a button instead to call the event to show all data unfiltered, it seems to be more logical for the user instad of a checkbox. Create List from another Listbox.